Scores of displaced Syrians were turned away by the Israeli army units on Tuesday as they attempted to approach the border fence along the Israeli-occupied Golan Heights. 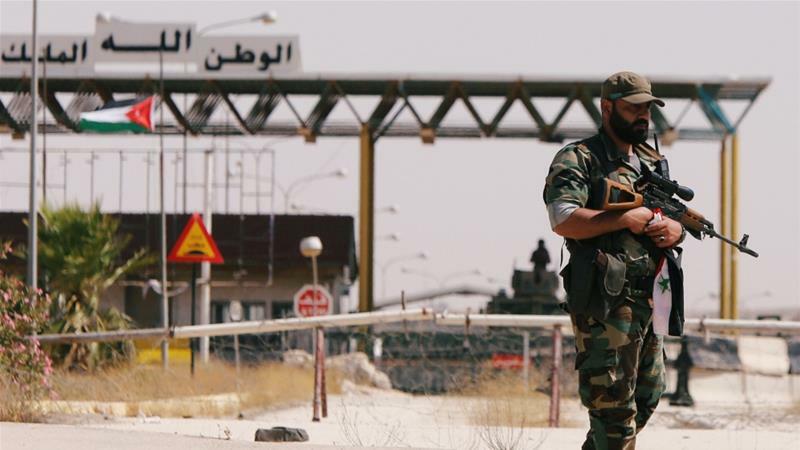 The incident on Tuesday happened in Quneitra, where the Syrian government is fighting to push out the last remaining pockets of rebels and fighters belongting to the Islamic State of Iraq and the Levant (ISIL, also known as ISIS). The displaced Syrians stopped some 200 metres away from the fence, before an Israeli soldier told them to leave. “You are on the border of the State of Israel. Go back, we don’t want to hurt you,” the soldier shouted in Arabic through a loudspeaker at the crowd, live Reuters TV footage showed. The crowd, which included women and children, then walked back slowly towards the IDP encampment. Some stopped midway and waved white cloths in the direction of the Israeli frontier. The group is among tens of thousands of Syrians who have arrived near the frontier over the past month following renewed fighting along the country’s southern Deraa and Quneitra provinces. Al Jazeera’s Stefanie Dekker reporting from the occupied Golan Heights, said the hundred or so Syrians that gathered along the border on Tuesday had nowhere else to go. And despite both Israel and Jordan providing some tents for some of the refugees, there are concerns about their living situation. “What we understand is that they have gone back to the tents in the makeshift camps where they’re residing,” Dekker said, adding that the displaced have to deal with the rising temperatures as well as sanitary and water issues. “There is another concern that people who have been living under rebel control of years [which] is repercussion measures by the Syrian government,” said Dekker. The UN estimates that 160,000 Syrians have been displaced because of recent unrest, triggered largely by the Syrian government and its Russian ally’s attempts to retake rebel-controlled territory along in the south. Israel has given humanitarian aid to IDPs in encampments close to a 1974 Israeli-Syrian disengagement line on the Golan but has said they would not be allowed to cross into Israeli-held territory. A witness on the Syrian side of the frontier said people were seeking shelter wherever they could as the offensive drew closer to their location. Lama Fakih, deputy director of the Middle East and North Africa division at Human Rights Watch, told Al Jazeera both the Israeli and Jordanian governments have an obligation to not push back fleeing asylum seekers. “The tens of thousands that have been displaced are fleeing extensive bombardment. They have left in many cases with literally the clothing on their backs,” Fakih said. “They are living in areas where is intense heat without adequate shelter, without adequate humanitarian assistance and despite the extreme humanitarian conditions and insecurity in the area, both the Israeli and the Jordanian government have persisted in not allowing these asylum seekers to try to seek refuge across the border,” he added. According to Fakih, the displaced group includes journalists, humanitarian aid workers and other individuals who the Syrian government has targeted, detained and executed in the past. Fakih said Israel’s response to developments along the border falls short of what is required to alleviate the suffering of displaced Syrians. Government forces backed by Russian air support have recovered large swaths of territory across southern Syria in the last three weeks, advancing unopposed by Assad’s western and regional foes into the strategically vital region near Jordan and Israel. What is the impact of Syrian forces’ gain in Deraa?